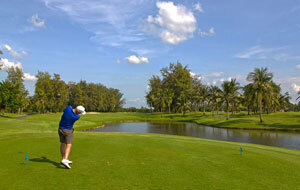 Many golfers from around the globe choose to visit Thailand for their holidays. 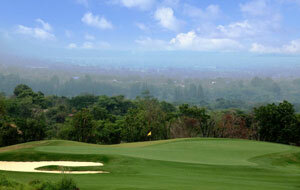 The climate, people, food, nature and golf courses combine to make the country a great place for a break. 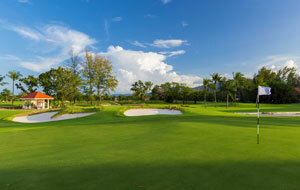 Thailand is increasingly becoming known as the number one choice in Asia for golf and we have some great Thailand golf packages available to suit every taste. However, before you start thinking about your Thailand golf break, we recommend taking a few minutes to find out about the country and what you can expect from the wealth of world class golf courses. Thailand is situated in central southeast Asia and the whole country is within the tropics. The country has borders with Laos to the north and east, Cambodia to the east, Malaysia to the south and east plus Myanmar and the Indian Ocean to the west. The size of Thailand is 512,000 square kilometres and can be split into four differing regions. The north is mountainous and forested, the centre is where the capital of Bangkok can be found, the north east is mostly flat plateau lands and the southern peninsula boasts great coast on both sides, with islands and fishing villages. The country is split into over 70 provinces but to make things easier, it has also officially been divided into six different regions, which cover the northern, southern, eastern and western areas of Thailand. You will notice that many of the regions also have a capital city by the same name. 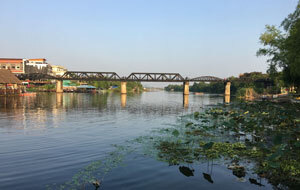 For example, Chiang Mai is a province and a capital city. The other main regions for golf in Thailand are called Chiang Rai, Isaan, Khao Yai, Kanchanaburi, Bangkok, Pattaya, Hua Hin and Phuket. Thailand was known as Siam until 1946, when the name was officially changed and this coincided with King Prachadhipok’s decision to change the form of government in the country from an absolute monarchy to a democracy. However, the history of Thailand can be traced back to Hindu and Buddhist Dvaravati culture before the start of the Chakri dynasty under King Rama I in 1782. The current capital of Bangkok was then founded and between 1804 and 1868, Thailand began embracing western innovations and a railway network soon developed prior to Thailand joining with Britain in World War I.
Thailand has seen many changes between the 1940’s and the current day but is now a constitutional monarchy, with a democratic government. Tourism now plays a huge role in the Thai economy, which has been doing well and continues to thrive. There is not an official religion in Thailand which means people can follow a religion of their own choosing. Interestingly however, there is a law which states the King must be Buddhist and this is the most common religion in Thailand, with over 90% of people following Buddhism. The remaining percentage of people are Muslim or Catholic Christians, with Hindu, Sikh and Jewish religions also followed by smaller numbers of the population. Other than the very southern areas of the country, the climate in Thailand can be split into three distinct seasons which are cool, wet and hot. However, for those visiting from Europe and North America, whatever time of year you visit Thailand the weather will be hot. Having said that, when booking a Thailand golf package, you will need to decide when you want to visit and the best time is between November and February, which is the cool season. Do not be deceived by the word ‘cool’, the temperature is still warm but is mild in comparison to other times of the year. Plus, rain is at a minimum meaning you will have plenty on uninterrupted time on the goal course. If you are playing golf in the north of Thailand between these months, be prepared for it to feel a little cooler at night. The hot season is between March and May and you will find temperatures can reach the mid-30’s or even higher. This can sometimes be uncomfortable for playing golf and you will need to take plenty of water and sunscreen with you. Between June and October is the wettest period of the year in Thailand, with September seeing the most rainfall so if you want guaranteed time of the course, you may want to avoid this time of year when booking your Thailand golf holiday. The same basic passport rules apply when travelling to Thailand for a golf break as they do when visiting any other country. Make sure you have at least six months remaining on your passport, there are six pages free and the passport is in good condition. 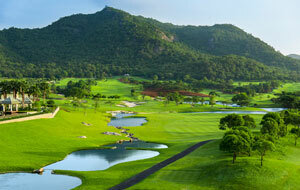 The great thing about visiting Thailand for a golf break is the Visa regulations. If you hold a British, Australian, American or Canadian passport, you do not need a Visa to visit Thailand for up to 30 days. These rules apply if you are entering the country via an international airport and you may only be granted 15 days if you are arriving in Thailand on the ground. You will also need to have sufficient funds for your stay plus a return airline ticket which falls within the 30-day Visa period. For nationals of other European and worldwide countries, the entry regulations may differ slightly and it is best to check the latest entry requirements well in advance. However, in most cases it will be standard practice. There is not a huge tipping culture in Thailand and you are not expected to leave a tip following a meal or service you have received. You are very unlikely to see someone in Thailand with their hand out waiting for a tip when you are leaving an establishment. You will find many hotels and restaurants already include a 10% service charge in the bill. However, tipping is always appreciated in Thailand if you have received good service, especially if you have had a good massage, waiter/waitress or great advice from a caddie. Many of these workers will only receive a small amount of what you have paid in their wages and anything you give will be very welcome. Travelling around Thailand may not be the same as many European or North American countries but it is very easy to get around the country. Thanks to the number of tourists visiting Thailand, the infrastructure has improved a lot in recent years and you can find your way around without any difficulty. You can use the trains, some of which are very scenic and offer fantastic views of the Thailand countryside and other areas you might have missed during your golf trip. There many tourists buses available throughout the country and you can also fly, with airports in Bangkok, Phuket, Chiang Mai, Koh Samui and Krabi. For added convenience you could also rent a car but driving in Thailand is not for the inexperienced and you are better off using a taxi and they are good value for money. Don’t forget if you are near the coast you can also use boats but these are not the most convenient if travelling to a golf course. 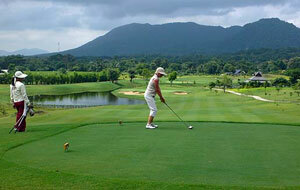 There are several main destinations within Thailand which make a great base when playing golf in the country. You are spoilt for choice in terms of golf courses wherever you decide to stay but there are five regions which offer the best golfing experience in Thailand. 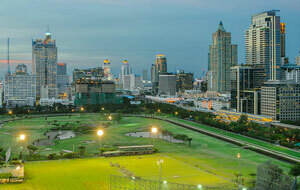 The city of Bangkok is a melting pot of cultures, people, food, entertainment, palaces, shopping and nightlife. Everyone should experience Bangkok and if you are arriving to Thailand via an international flight, there is a good chance your golf holiday will start here. 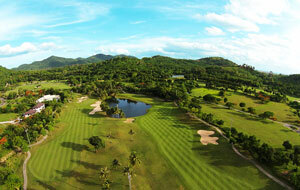 From the centre of the city, you only need travel for 30 minutes to reach the best golf courses in the area. 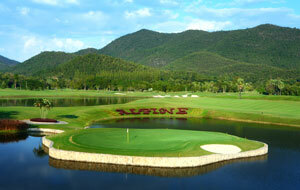 The Alpine Sports and Golf Club is rated as one of Thailand’s top golf clubs and has played host to Tiger Woods. 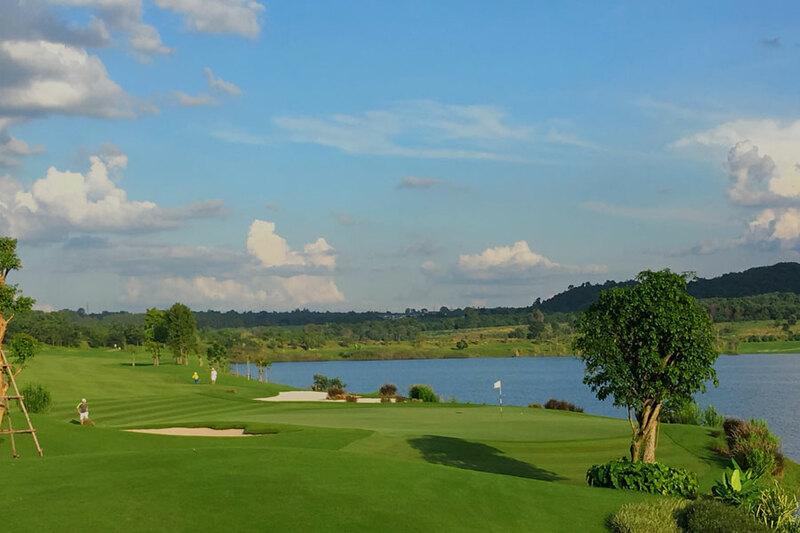 Amata Spring Country Club has successfully staged the Thailand Golf Championship and you will also find top golf courses designed by the biggest names including Robert Trent Jones Jr, Arnold Palmer, Jack Nicklaus, Gary Player and Nick Faldo. 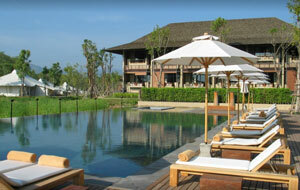 Hua Hin is a traditional Thai seaside resort located on the Gulf of Thailand. What was once a quiet fishing village became a hot spot for the residents of Bangkok as a getaway destination from the capital city in the 1920’s. Hua Hin provides a great mix of city and sea lifestyle, with exciting markets, great food, fun water parks and excellent golf courses. 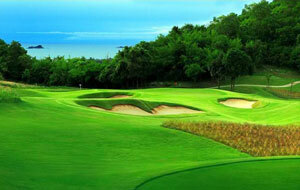 Here you can find Thailand’s first 18-hole golf course, Royal Hua Hin Golf Club. You can step back in time and enjoy a lovely round of golf while looking out for the trees and shrubs shaped into animals and Thai mythological creatures. 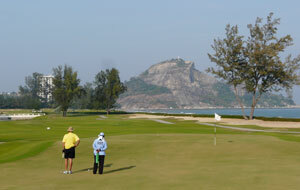 However, Hua Hin has come a long way since the opening of Royal Hua Hin Golf Club and now boasts some of the most modern golf courses in Thailand. 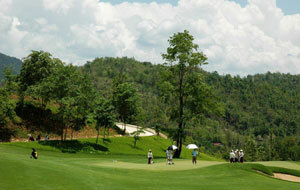 Golf Clubs including Black Mountain, Banyan Golf Club and Springfield Royal Country Club are high on the list of any golfer booking a golf holiday to Thailand. Phuket is an island located in the Andaman sea and has its own international airport linking it with mainland Thailand and the rest of the world. This is the largest Thai island and boasts a wide choice of activities for visitors including beaches, diving, restaurants, national parks and wildlife encounters. 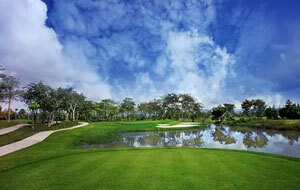 However, due to the size of the island it is also home to some of Thailand’s best golf courses. 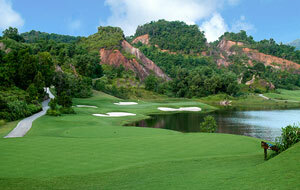 Two of the stand out golf clubs on Phuket are Blue Canyon and Red Mountain. 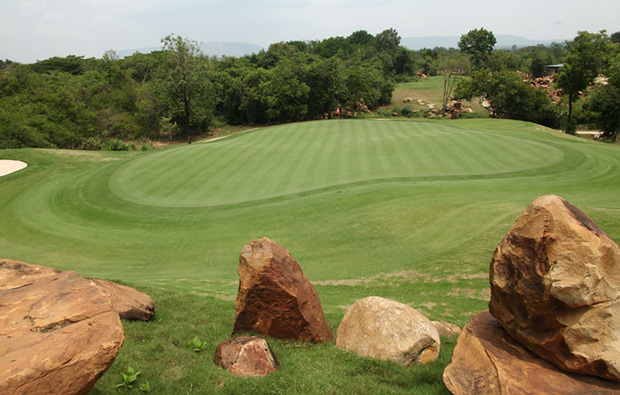 The former is home to two excellent golf courses, the Canyon Course and Lakes Course and has played host to the Johnnie Walker Classic on more than one occasion. 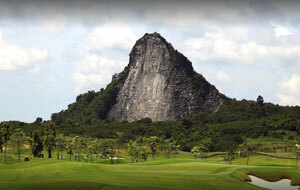 Red Mountain has some of the most spectacular scenery found on any golf course in the world and if you were to play on one golf course in Thailand, this would be at the top of the list. Pattaya is a city on the eastern Gulf cost of Thailand and is known for its superb beaches and the spectacular Wat Phra Yai Temple, which features an 18m-tall golden Buddha. There is a great choice of places to stay and eat and Pattaya is known for having a family friendly resort style coast. 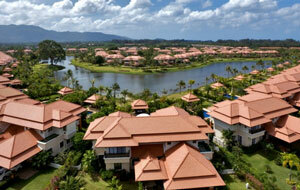 There is also a large retired expat population in Pattaya and many bars to enjoy. Pattaya is well known for its excellent choice of golf courses, with Siam Country Club and Laem Chabang being two of the very best in the region. 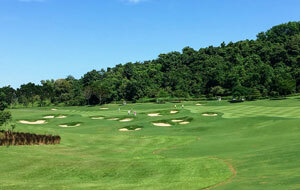 There are three top-quality golf courses to choose from at Siam Country Club and it’s tough to single one out above the others but if you had to pick just one, the Plantation Course is regarded by many as a must-play in Thailand. Chiang Mai is a city in the north of Thailand and offers a relaxing contrast to Bangkok and the coastal regions of the country. This forested and mountainous landscape which surrounds the city is easily reached from the historic centre and offers waterfalls and countryside villages to explore. 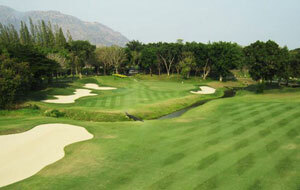 Combined with the blissful nature of Chiang Mai’s setting, you will find some fantastic golf courses. 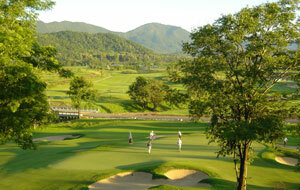 Some of the best include the Alpine Golf Resort, which is in an enviable position between the mountain ranges and Chiang Mai Highlands Golf and Spa Resort which is rated by many as being the best in this region of Thailand. Perhaps the greatest thing about playing golf in Chiang Mai is the feeling of being in rural Thailand yet still enjoying a world class golfing experience. 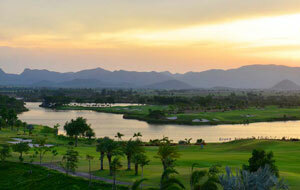 Playing golf in Thailand is a truly memorable experience. 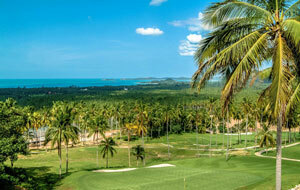 With a great climate, welcoming people, stunning coast line, fantastic food, blissful nature and a choice of golf courses to match anywhere in the world, what more do you need to book your Thailand golf package?